Up until the early 1970s, the U.S. Army conducted Performance Critiques after training activities. 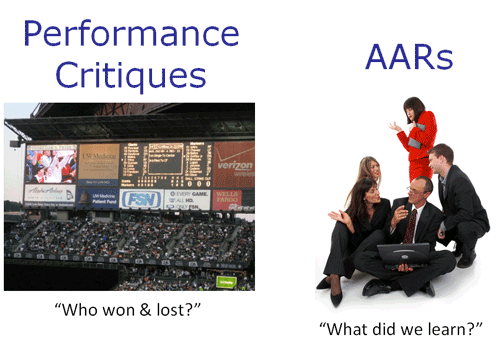 When they performed a study on the Performance Critique to look for improvements, they discovered a major flaw in it. The training activity was observed by umpires who determined an estimated outcome, then performed a lecture-formatted critique to the participants (Morrison, Meliza, 1999). The lecture was most often a subjective opinion and negative in tone, thus it often fomented disempowerment, frustration, resentment, and resistance in the participants. In turn, lessons were rarely, if ever, learned. The U.S. Army is probably one of the world's largest hierarchical and bureaucratic organizations, however, when they implemented the After Action Review (AAR) it learned to flatten itself and become a more horizontal or flat organization, which in turn, allows it to become a learning organization. It does this by involving all the participants, from the lowest-ranking soldiers, to commanders, to interested outsiders and observers. The AAR allows it to focus on the goals and tasks to discover why things happen... rather than to judge success or failure. An AAR is perhaps one of the ultimate performance improvement tools because it encourages all members, no matter what their title or role is, to share and learn in order to have continuous improvement. An AAR is an assessment conducted after a project or major activity that allows both employees and leaders to discover and learn what happened and why. It may be thought of as a professional discussion of an event that enables employees to understand why things happened during the progression of the process and to learn from that experience. Examples of when to use it are: introduction of a new product line in a production facility, after a busy holiday season in a retail store, introduction of a new computer system upgrade, after a major training activity, a change in procedures, etc. The key to an AAR is openness and honesty that allows all the participants in the organization to participate, which allows them to capture what really happened so that lessons may be learned (Walden, 2009). It affords leaders and followers the opportunity to gain maximum benefit from every program, activity, or task. Also, the AAR does not have to be performed at the end of a project or activity. Rather, it can be performed after each identifiable event within a project or major activity, thus allowing it to becoming a real learning organization. As a leader, you are responsible for training your workforce. The AAR is a tool that can assist you with developing your employees. It does this by providing feedback. Normally, feedback should be direct and on-the-spot. Each time an incorrect performance is observed, it should be immediately corrected so that it will not interfere with future tasks. During major projects or activities, it is not always easy to notice incorrect performances. Indeed, in many cases, the correct performances will be unknown because these projects or activities are complex learning activities. That is why the AAR should be planned at the end of each activity or event... so that feedback can be provided, lessons can be learned, and ideas and suggestions can be generated into the next project or activity. An AAR is both an art and science. The art of an AAR is in the obtainment of mutual trust so that people will speak freely. Innovative behavior should be the norm. Problem solving should be pragmatic and employees should NOT be preoccupied with status, territory, or second-guessing “what the leader will think.” There is a fine line between keeping the meeting from falling into chaos where nothing gets accomplished; to people treating each other with dignity and respect so that they can learn from one another. An AAR may be formal or informal. Both follow the same format and involve the exchange of observations and ideas. However, formal ones are normally more structured and require more planning. While informal ones are conducted anywhere, anytime, in order to provide quick learning lessons. Review events leading to the activity (what was supposed to happen). Give a brief statement of the specific activity. Summarize the key events. Encourage participation. Have the junior leaders state the portions of their part of the activity. Ask the participants to state what happened from their own point of view. Ask why certain actions were taken. Ask how they reacted to certain situations. Ask when actions were initiated. Ask leading questions if needed to ensure all the key results are obtained. 3. What caused our results (lessons learned)? This part of the AAR helps the participants to identify the performance gap — the difference between the intended goal and its objectives and the results actually obtained. Relate events to subsequent results. Have the participants exchange stories (see note 1 below). Explore alternative courses of actions that might have been more effective. Do not turn it into a lecture, but rather allow the participants to learn. Critiquing an idea is fine, but do not allow attacking people. If the discussion turns to errors made (finger pointing), emphasize the positive and point out the difficulties of making tough decisions. Allow junior leaders to discuss the events with their people in private if needed. Note 1. Tacit knowledge is personal experiences that cannot be articulated very easily as it is too deeply entwined and embedded in the person. One of the best ways to help transfer it to others is through the use of stories (narratives) that have the power to draw others into the personal experiences of the storyteller. 4. What will we sustain or improve? This part of the AAR is for identifying what is working and what needs improvement. You should strive to allow others to offer solutions, rather than you offering them. This allows all the participants the opportunity to learn and grow. Using the notes, go over the main points to ensure each problem is addressed. Ensure someone is identified to Follow-up on each needed action. Call out what worked well so that good ideas are not lost. Ask thought-provoking questions that allow others to add their ideas. 5. What are some upcoming activities that will allow us to use our lessons learned? This part of the AAR ensures you actually put the lessons learned to good use by identifying opportunities; otherwise, the lessons will soon be forgotten. Have someone write down the main points for each part of the AAR. Remain unbiased throughout the review. Try to speak to draw out comments from all. Do NOT allow personal attacks (critiquing an idea is fine, attacking people is a no-no). The focus should be on learning and continuous improvement. Strive to allow others to offer solutions, rather than you offering them. As a last step, ensure the notes that were recorded are posted, such as to a wiki, blog, or web site that will allow people to refer back to them, in addition to allowing others to use the material when searching for information. A properly conducted AAR can have a powerful influence on the climate of your organization. It is part of the communication process that educates and motivates people on to greatness by sensitizing them to do the right thing. It can prevent future confusion on organizational priorities and philosophies, and drive home the point that we learn from our mistakes. Darling, M.J., Flanigan, D.C. (2008). What can leaders do? Learning and Performance Matters, Kumar, Ramsey (eds.). Singapore: World Scientific Publishing Company. Department of the Army (1993). A Leaders Guide To After Action Review. Headquarters Department of the Army Washington, DC. TC 25-20. USAID (2006). After Action Review Technical Guidance. PN-ADF-360. Washington, DC: U.S. Agency for International Development. US Army Combined Arms Center (2011). Leader’s Guide to After-Action Reviews (AAR). Ft Leavenworth, KS. Morrison, J.E., Meliza, L.L. (1999). 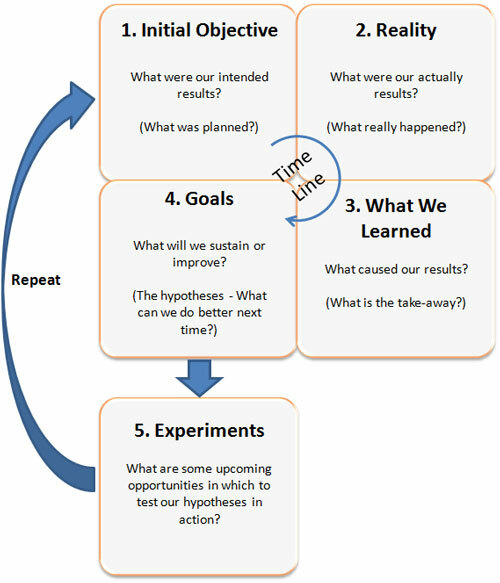 Foundations of the After Action Research Process. Washington, D.C.: U.S. Army Research Institute. Walden, J.L. (2009). Modeling and Benchmarking Supply Chain Leadership. Boca Raton, FL: Auerbach Publications. Updated September 1, 2015. Created May 1, 1997.